Roman villa, settlement or town? In 1916 a hoard of Roman coins was discovered as workmen dug a ditch for a new drain to the south of Westland Road. 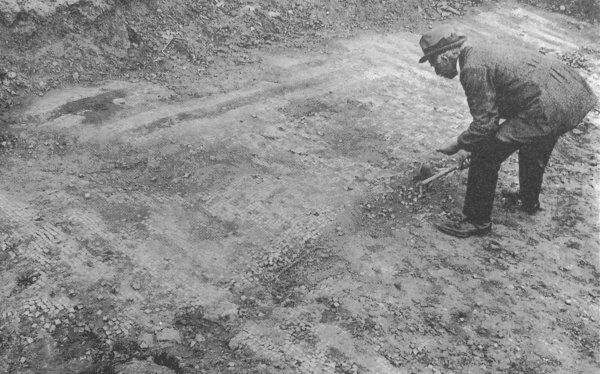 In 1925 the Borough Council purchased the land for new housing and Alderman, later Mayor, William RE Mitchelmore undertook a preliminary excavation that year, his work revealing extensive foundations. This was followed up in 1927-28 by archaeologist and historian CA Ralegh Radford. Initially thought to be a Roman villa, it is now thought that a more comprehensive and extensive Roman complex was sited here that may even have been a Roman town. A mosaic pavement was lifted from the site and installed in the old museum in the municipal offices in King George Street, later occupied by the Council's Technical Department at which time it was covered with hardboard sheeting for protection. It was lifted in 1987 and moved to Brympton House, but has now been moved again to the Community Heritage Access Centre. 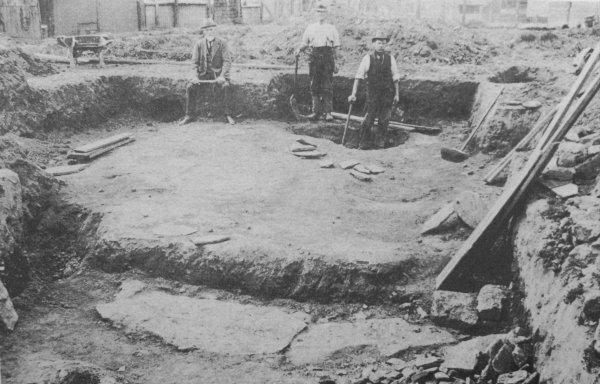 "A supposed Roman courtyard villa situated in a field to the west of Seaton Road, Westland, Yeovil, was excavated in 1925 by Alderman Mitchelmore and in 1927/8 by Ralegh Radford. Previously on September, 15, 1916 a hoard of some 4000 'third brass' 4th century coins had been found on the site during drain laying for a new estate. The excavations revealed the remains of a large house built round a paved courtyard, 200 ft. x 170 ft. with many tessellated pavements, coloured plaster, hypocausts and baths. There were rougher buildings and a barn on the south side of the courtyard. The west and south walls of the house were bounded by roads approximately 1 foot thick. Many small finds were made including much pottery (mostly coarse ware), but also some Samian and New Forest ware. Coins found were of Vespasian to Gratian but predominately of the 4th cent. The finds suggest an occupation period of about 200 years (c.180-370 AD). Under the foundations of room 23 a rough stone hearth was uncovered, together with three iron arrowheads, several flint flakes, and some late Roman and 1st cent. BC pottery, suggesting a hut of the early Iron Age. Other remains nearby, in an area bounded on the east and west by Seaton Road and Horsey Lane and on the west by the Roman road probably represent a few outlying dwellings of poorer class. 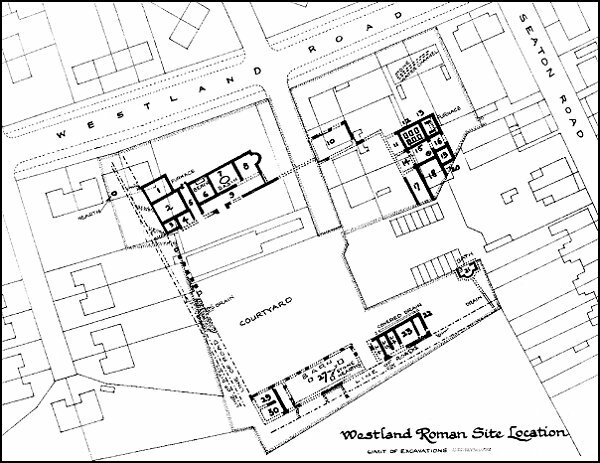 The Roman site at Westland has been considered generally as a villa, but the evidence from excavation shows that it may be a small town, with a street grid, and extending possibly over 40 acres. The buildings examined in 1928 may be individual houses rather than a unitary villa. There are no surface indications of the villa, and the northern and part of the eastern range is now overlaid by modern houses." The above description is taken from the English Heritage Archaeology Data Service. "Roman settlement remains situated immediately south of Westland Road. The remains include several Roman town houses and at least two minor roads. This was once a Roman town which was situated beside a major road linking Lindinis (Ilchester) to Durnovaria (Dorchester). A partial excavation of this site took place in 1927-8. A series of buildings around a paved courtyard were uncovered. These buildings are thought to represent at least four separate town houses, also exposed was a large open structure. These buildings were constructed to a high standard; one was of bascilican form and most of the rooms were floored with mosaic or yellow cement. A substantial building of 'L' -shaped plan was located on the north west side of the courtyard and displays several internal features which indicate that it belonged to a person of high status. A further partial excavation was undertaken in 1980 which located a wall and an additional stone-lined drain on the north east side of the site. Dating evidence suggests a first century AD foundation for the town and a continued occupation throughout the Roman period until at least the fourth century." A map by Leslie Brooke showing the extent of the Westland Roman complex excavations. 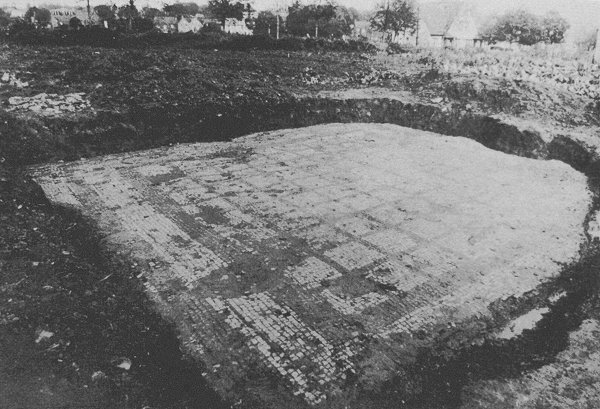 One of the Roman mosaic pavements excavated at the Westland complex in 1925. 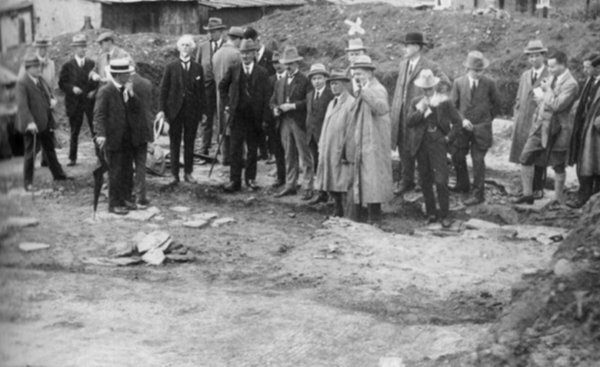 Local dignitaries inspect the excavations.